Another delicious challenge, another chance to win useful gifts! 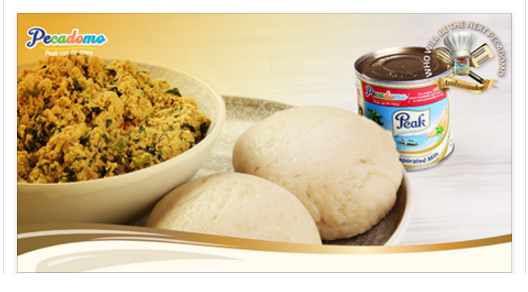 All you have to do is create your own version of Milk Eba with Egusi soup (see the recipe here: http://www.peakmilk.com.ng/pecadomo/home), adding your special touch and send a picture of your dish and yourself to peakmilkng@gmail.com. Follow the steps: http://www.peakmilk.com.ng/pecadomo/ambassador, be creative and you may become the next #PecadomoAmbassador! 1. Make your own version of the Video of the week BELOW. You have to add your special touch and tell us what that touch is. 2. Take a creative picture showing you and your finished dish with can of Peak evaporated milk. Winners will be announced a day after the close of contest week.